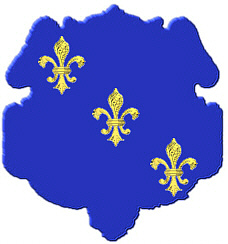 Coat of Arms: Blue with three gold fleur de lis. Crest: A lion holding in the paw a gold fleur de lis. and symbolically, in heraldry the Lion is an emblem of majesty, strength, justice, military strength, and deathless courage, a definite fierce foe to their enemy. French heraldry calls the passant lion a leopard; accordingly Napoleon said to his soldiers, "Let us drive these leopards (the English) into the sea." In heraldry any Lion not rampant is often called a lion leopardé. Another tradition is that the Lion is the only animal of the cat tribe born with its eyes open, and it is said that it sleeps with its eyes open; although not completely true the Lion does sleep watchfully and lightly. 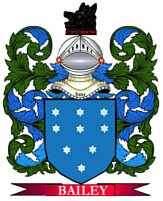 The Lion in the arms of Scotland: Derived from the arms of the ancient Earls of Northumberland and Huntingdon, from whom some of the Scottish monarchs were descended. The Lions in the arms of England: Three Lions passant guardant, i.e. walking and showing their full face. The first Lion was that of Rollo, Duke of Normandy, and the second represented the country of Maine, which was added to Normandy. These were the two Lions borne by William the Conqueror and his descendants. Henry II added a third Lion to represent the Duchy of Aquitaine, which came to him through his wife Eleanor. Commonly referred to as "the king of the beasts," it is a symbol of kingly power and might, but as the lioness it is commonly related to the Great Mother and to protection. Fleur-de-lis, sometimes seen as Flower-de-luce, is the flower of the iris or lily, whose name "lys" has a certain resemblance to that of Leys, or Louis, a common name of the Kings of France.